Almost 7 years ago, I walked into a tae kwon do school as a student for the first time. I had been in dojangs many times before, since both my brothers had practiced tae kwon do. Over the next 6 1/2 years, I spent so much time at the dojang that I considered it my second home. I started knitting because of the amount of time I sat upstairs watching my children's classes, and in between classes, waiting for my own class time. I petitioned our master to install a kitchen so that I could cook while we were there. Sadly, that request was denied. My very identity changed during those years. My identity became tied to martial arts. 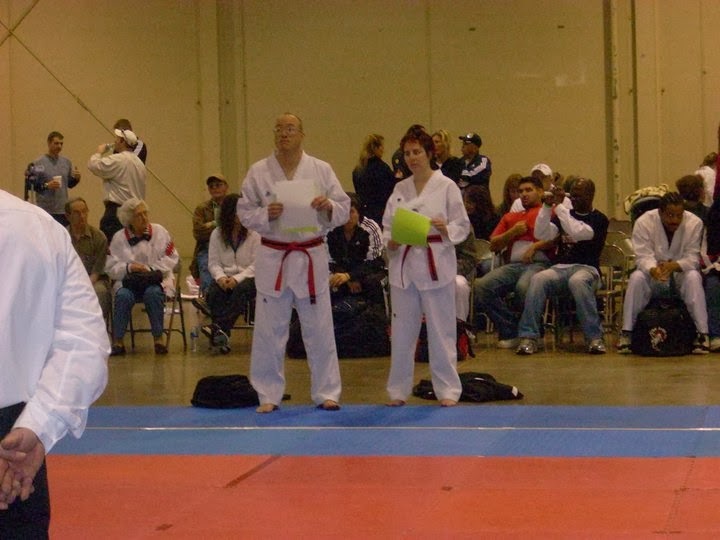 6 years ago, I began competing in tae kwon do. I remember my first tournament and how nervous I was. I remember how cold my feet were, since it was held on an ice rink. All of me was consumed by tae kwon do. We were at the dojang 6 days a week, sometimes for 5 hours at a time. 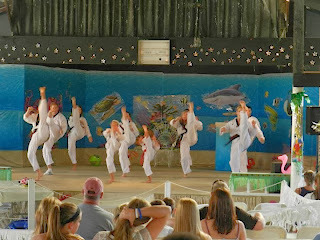 Our every movement was designed to fit into our tae kwon do schedule. That all came to a screeching halt in April. I was having breathing problems that were getting scarier and scarier each time they happened. I finally stopped doing tae kwon do out of fear while we tried to figure out what was causing the problems. May of 2012, I had my first episode. I was competing in a tournament for the first time in almost a year. I felt good. It was a home tournament, and I was fighting a woman I love and adore. We're both very competitive, and the trash talk was running hot and strong that day. After our fight, which was a fantastic fight, we sat down to talk. Suddenly, I couldn't breath. My throat felt like it had cotton in it. Every breath was labored. If I attempted to draw a deep breath, I started coughing. And it wouldn't stop. We tried giving me albuterol, even though I'd never had asthma before. It didn't help. Finally, we took all my gear off, and I laid down on the floor. Finally, my breathing evened out, and I began to recover. I didn't know until later that my doctor, whose wife I had been fighting, was almost ready to call an ambulance because my lips were turning blue. In November, when I began competing again, I had a severe episode. It caused my chest to hurt, which was pretty scary. It took me several hours to recover completely from that episode. Probably because I insisted on finishing my match after the episode started. I've never been accused of not being stubborn. I never thought I'd have to hang my black belt on this rack. Fast forward to April of this year. I had an especially bad episode, and the paramedic at the tournament and my doctor both wanted to send me to the hospital. I wouldn't let them because Gary was fighting, and none of the boys had fought yet. I wanted to see their fights. But it scared me. A lot. And I decided to stop practicing tae kwon do until we could figure out what was causing my episodes. But, my primary care manager had dropped my insurance, and I had to change doctors, then get a referral, yada yada yada. My new PCM referred me to a pulmonologist to be sure I didn't have exercise induced asthma. I spent several hours exercising and breathing. Not only do I not have asthma, but I have supranormal pulmonary function. (Thank you years of playing musical instruments and taekwondo!) So we were once again at a loss. We didn't know where to go from here. Then, I was getting blood drawn for genetic testing and I saw a sign that said, "If you're allergic to these foods, you may be allergic to latex." Well, I knew that some of those foods gave me oral allergic reactions and that I was allergic to latex. But they were all mild allergies. What I didn't know was that they were all related to one another, or that exercise could exacerbate anaphylaxis. That sign sent off alarm bells in my brain. So, I went to my PCM and asked if perhaps what I was experiencing was anaphylaxis. For the first time in my life, I had a PCM agree with me. She sent me to an allergist. Today, I got confirmation that I was going into anaphylactic shock when I was competing. You see, my gear has latex in it. Oh, and the foods I eat on competition days? Apples and bananas, those foods strongly related to latex. That's right, folks, I was poisoning myself. So, I was given two options. I could either take allergy medicine every single time I step on the mat, or I can stop practicing tae kwon do. So, I cleaned out my locker. I'm going to have to find a new love. I'm thinking dancing, yoga, or maybe acrobatics. All of these things are of interest to me. I'd love to try stick or sword fighting. In the meantime, I'm running. But I'm not a runner. I don't know if I'll ever be a runner the way I was a martial artist. I can see myself being a dancer that way, though. And so the search is on for a new passion. Wish me luck!